At the corner of Dr. Martin Luther King, Jr. Boulevard and Court Street in Newark’s Central Ward, a castle towers over the landscape. Since 1888, the Krueger-Scott Mansion has sat on a hillside overlooking the city. It was originally the home of Gottfried Krueger, the owner of a local brewing company, who wanted it to “‘outdo’ the home of fellow Newark brewery owner and competitor, Mr. Ballantine,” according to Newark Happening, referring to the Washington Street house that is now part of the Newark Museum. When completed, the mansion contained 26 rooms, six chimneys, and New Jersey’s first residential elevator, according to The New York Times. Several years after the Krueger family left the property, the mansion became the headquarters of the Scottish Rite organization, and was later the home to Louise Scott, the owner of the Scott College of Beauty Culture who was likely “the first black woman in the city to become a millionaire,” according to The Times. Afterwards, the mansion served area residents as the Scott Civic Center. Yet, for the last few decades, the City-owned palace has been abandoned, surrounded by a barbed wire fence, overgrown weeds, and a broken staircase. There was a proposal 25 years ago for the City to renovate the decaying structure and create an African-American cultural center inside, but the plans were canceled and the building has been in a state of disrepair in the years since. In 2011, Preservation New Jersey declared it to be one of New Jersey’s most endangered places. However, the days of the Krueger-Scott Mansion remaining in this condition could soon be numbered. As part of the proposal, the mansion would be rehabilitated “in a historically respectful and accurate manner,” and could feature rooms named for notable Newark natives. 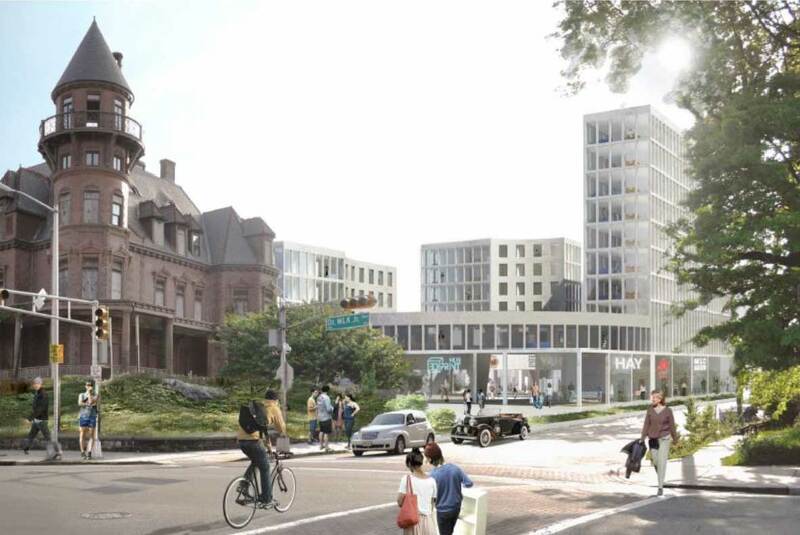 A new neighborhood, called a ‘Makerhood,’ would be constructed behind the building that would feature an urban farm, a plaza, 16 affordable apartments, 50 market-rate apartments, 36 parking spaces, and 16 to 20 shops, including restaurants, a dining facility possibly created in partnership with the Rutgers Food Innovation Center, artist spaces, and possibly a pub called Krueger NanoBrew. This community would include a five-story building, a seven-story building, and a ten-story building. The project would be developed by Avi Telyas of Seaview Development, and calls for creating an affordable live/work center for makers, entrepreneurs, and micro-manufacturers that would include a business incubator, co-working space, educational support, and a community event space with a monthly speaker series. According to plans obtained by Jersey Digs, “for a combined $1,800/month an entrepreneur can lease a workspace to conduct a business such as retail, light manufacturing or artistic activities, and occupy an apartment above it for a zero-commute, low-cost operation.” There would be revenue of over $500,000 per year with a net cash flow of $24,390. 85 jobs are expected to be created upon completion of the development. ”All the details to it are just fascinating because it’s really game-changing in its concept,” said Garcia, who added that the proposal will go before the Newark Municipal Council on June 21st. It is also the home of the Monarch and also potentially the blue morpho!!! The Blue Morpho was the junk yard dog of the original Team Venture! The best of all worlds all wrapped up in this development! Funny there is not one African American in the rendering!!!!! I absolutly love that house. I can’t wait to see this happening!!! These have to be the ugliest and most repellent living quarters I have ever seen. Looks like a hospital. I do hope this time something actually happens to save this historical building. I taught at Irvington High School in the mid-1980s and took a group of students to see it. Sometime after that it was discovered that the house was stripped of it’s mantels, light fixtures, and anything else that had value in the Antique Market. Too bad. I actually have a Krueger beer bottle! love this idea! loving what Newark is becoming! I would love to see the home that KRUEGER built back to its original glory! !